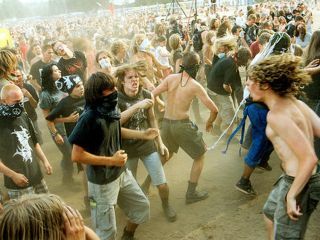 Some metal fans get "gentle"
The research, carried out by Professor Adrian North of Heriot-Watt University in the UK, is reported to be the largest such study ever undertaken. Professor North described the research as "significant" and "surprising". As well he might. His findings suggested heavy metal fans were gentle and at ease with themselves, while indie fans had low self-esteem, were not hard-working and not gentle. Professor North continued: "We have always suspected a link between music taste and personality. This is the first time that we've been able to look at it in real detail. No-one has ever done this on this scale before." "One of the most surprising things is the similarities between fans of classical music and heavy metal." He said the research could have many uses in marketing, adding: "If you know a person's music preference you can tell what kind of person they are, who to sell to. There are obvious implications for the music industry who are worried about declining CD sales. "One of the most surprising things is the similarities between fans of classical music and heavy metal. They're both creative and at ease but not outgoing." It's no doubt an interesting piece of research, but how many people do you know who truly only like one style of music? Are people not more more complex than this?